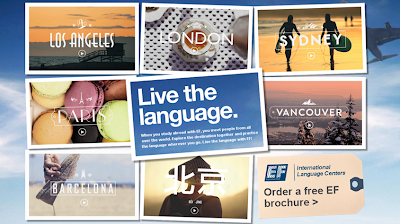 This campaign from EF languages, illustrates beautifully the concept "content is king" for online marketing. Yes, we know. SEO professionals love repeating the mantra-like phrase "Content is King". But it's not an exageration to say that quality content is key to online success. Contrary to popular belief, this doesn't mean an article vaguely related to your industry full to bursting with keywords (this wouldn't fit the "quality" part!). It's something that people will find of value. On a small scale this could be an article with handy hints and tips, a tutorial, or an opinion piece. Or with a larger budget, a short film, comic strip, infographic or even an online service. This film, one of a set comissioned by EF Language schools, was launched in 2010. It consisted of 4 short films, shot in London, Paris, Barcelona and Beijing, to entice viewers to "live the language" and "make you want to pack your bags". The combination of beautiful typography and playful visuals capture perfectly the emotions of being young and learning a foreign language in a new city. It's not a story of small business success (EF has around 400 schools in 50 countries), but it certainly is an inspiring one. These quirky and artistic films were not backed by any impressive media budget - it was in the blogosphere and Social Media that they caught on and created a "buzz". It's all about the campaign, not the platform. The beauty of these films is that they are essentially a "stand alone" product. We're not bombarded by "Like us on Facebook" and "Follow us on Twitter" messages at the end - as after all the aim is to increase sales of language course bookings. A handy link under the video invites viewers to "order a free brochure". Could this be the future of online marketing? After all, in terms of SEO, EF languages doesn't rank on the 1st page of Google results for the competitive search term "language school abroad". But the Paris video alone has over 200,000 views on Youtube. Social Media means that it's possible to successfully market products through innovative ways - if you're ready to be creative that is! You can clearly see the efficiency of social media campaign just about everywhere. Even in dental advertising, promotion via Facebook or Twitter drives traffic as well as prospective clients.